Growing up, when we would travel as a family, with my dad, we would stop every 60-90 minutes. Dad had to stretch his legs. So, I was pretty used to that...then I met Steve. When he travels, he is used to just going and getting there, with as few stops as absolutely possible. I quickly adapted to this way of traveling until my mom started traveling with us....we are at a sort of happy medium. We stop more than Steve was used to, but less than when we traveled with my dad. 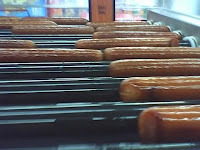 So, last night, after finding the icky hot dogs once again...we ventured off to find something else to eat in Fillmore...we ended up at Larry's Drive In, just across and down the road from Maverik, at 1030 South Highway 99, phone number 435-743-5411. We got there right at closing time, 9pm, but they were nice enough to let us in, anyway. It was a little high priced, so we just got an order of chicken nuggets and a corn dog with an order of french fries. The chicken nuggets were ok, but we probably wouldn't order them again. The corn dog was very good, much like Arctic Circle, as they both use Foster Farms. The french fries were very good, but very high priced, too. We would like to go there again and try the hamburgers and shakes. I tried finding anything about this place on the internet, but didn't have much luck. It does not have a website and it seems that it is listed on a bunch of other websites, but with no reviews or other information. So, I hope you find this helpful and yes, I would recommend Larry's as a great place to grab something fast and delicious! Ewww... I think I threw up in my mouth... Those are disgusting!! I would have to say that hot dogs are my most hated food - or at least tied with ketchup and the combo of the 2 together makes me ill! Unfortunately both of my Hemas love both items, but I never buy them. 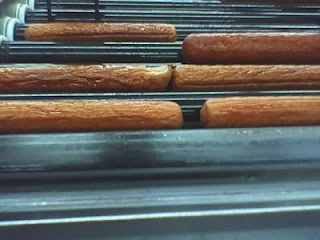 Those hot dogs did look gross, of course I'm not sure I've ever seen a good one. 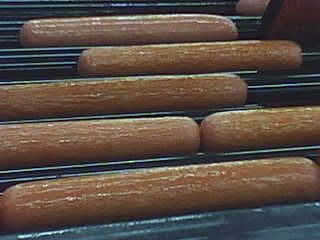 I hate hot dogs so much that I would rather eat a real dog and have done so before! And it was tasty and not nasty like a hot dog! That is a true story! The end. A hot dog is not a hot dog without ketchup! We will definitely have to have you guys over and you can ignore the hot dogs leaving more for us to enjoy, LOL!